After writing a six part series on American rural comedies in the Sixties and feeling a bit under the weather, I don't feel up to a full fledged blog post. I will then leave you with a clip of The Beatles performing their 1965 hit (and the theme to the film of the same name) "Help!" I wish I knew where this clip originated, but sadly I have been able to find out. The debut of The Real McCoys in 1957 proved to network executives that television audiences were more than willing to watch rural comedies. Its success paved the way for more rural comedies, including The Andy Griffith Show. It was the success of The Andy Griffith Show in the 1960-1961 season that started off a cycle towards rural comedies that included The Beverly Hillbillies, Petticoat Junction, Gomer Pyle U.S.M.C., and Green Acres. The cycle slowed a bit in the mid-Sixties with no new rural comedies debuting in the 1966-1967 and only one in the 1967-1968 season (Accidental Family), but it was not quite over yet. The 1968-1969 season saw the debut of three new rural comedies. Except for Andy Griffith, Ron Howard, and Aneta Corsaut, Mayberry R.F.D. retained most of the cast of The Andy Griffith Show, including George Lindsay as Goober Pyle (Gomer's cousin who was a mechanic), Jack Dodson as county clerk Howard Sprague, and Paul Hartman as fix it shop owner Emmett Clark. Even Frances Bavier remained part of the cast for a time. She became Sam Jones' housekeeper and remained with the show through its second season. She was replaced as Sam's housekeeper by his cousin Alice (played by Alice Ghostley), who had just finished a stint in the military. Arlene Golonka, who had played a love interest for Howard Sprague in two episodes of The Andy Griffith Show in its final season, played Sam's girlfriend Millie Swanson. Andy Griffith would guest star on Mayberry R.F.D. three more times during its first season, as well as in the first episode of its second season (which dealt with the christening of his new baby, Andy Jr.). Mayberry R.F.D. debuted 23 September 1968 on CBS. 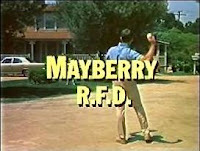 Unless one considers it a continuation of The Andy Griffith Show (which would be very valid), Mayberry R.F.D. was the top rated new show of the 1968-1969 season, coming in at #4 in the Nielsen ratings for the year. It continued to receive good ratings for the rest of its run. Unfortunately Mayberry R.F.D. would be one of the victims of the Rural Purge at CBS. At the time of its cancellation at the end of the 1970-1971 season it was ranked #15 in the Nielsens for the year. The second rural comedy to debut in the 1968-1969 season is unique among television shows in having gone through multiple format changes in its five year run, to the point that it was no longer a rural comedy by its third season. The show also starred a bona fide film star, Doris Day. Miss Day is one of the biggest movie stars of all time. From 1959 to 1966 she ranked every year in the top ten of Quigley's annual list of top box office stars, four of those years in the #1 spot. It would be a number of factors which would bring Doris Day to television. The first is that by the late Sixties her movie career was in decline. The Ballad of Josie (1967), Caprice (1967), and Where Were You When the Lights Went Out? (1968) all performed badly at the box office. The second was that following the death of her husband Marty Melcher on 20 April 1968 she discovered that he and his business partner (and Miss Day's attorney) Jerome B. Rosenthal had mishandled the millions she had earned through her films. Quite simply, she was bankrupt. The third was that she discovered Marty Melcher had signed a contract with CBS for her to do a television series without consulting her. Doris Day did not particularly relish the idea of doing a television show, but felt obligated to do so. The show would also give her money to help pay off her debts. As to Jerome B. Rosenthal, Doris Day sued him and eventually won a civil judgement of $22 million. The Doris Day Show debuted 24 September 1968. In its original incarnation Miss Day played Doris Martin, a widow with two sons, Billy (played by Philip Brown) and Toby (played by Todd Starke). Doris had recently returned to her father's ranch outside of San Francisco, California. Her father, Buck Webb, was played by Denver Pyle. James Hampton (who had played Private Dobbs on F Troop) played their ranch hand Leroy B. Simpson. For the first ten episodes of the season Fran Ryan played their housekeeper Aggie, after which Naomi Stevens took over as their housekeeper Juanita (no explanation was ever given for Aggie's departure). While The Doris Day Show did very well in the ratings (it ranked #30 in the Nielsens for the year), the second season would see a slight change in the show's format. While Doris and her sons remained on Buck's ranch, she took a job with the magazine Today's World and commuted to San Francisco. New characters were introduced in the form of Michael Nicholson (played by MacLean Stevenson), the editor of Today's World and Doris' boss, and her co-worker Myrna Gibbons (played by Rose Marie). Buck and Leroy still appeared on the show somewhat regularly, although Juanita had totally disappeared. Despite the show doing extremely well in the ratings (coming in at #10 for the year), The Doris Day Show would see yet another change in its format for the third season, as Doris and her boys moved away from the ranch and into San Francisco. Of course, at this point The Doris Day Show ceased to be a rural comedy entirely. Strangely enough, despite ranking #20 for the year, The Doris Day Show would see one last format change in its fourth season. Suddenly and without explanation Doris played a single career woman (although her name was still Doris Martin) with no children. No mention was made of her sons or what had become of them--it was as if they had never existed. She also had a new boss at Today's World, Cy Bennett (played by character actor John Dehner) and a new cast of supporting characters. This format would remain in place for the last two seasons of the show. At the end of the 1972-1973 season CBS wanted to renew The Doris Day Show for a sixth season, but Miss Day chose to no longer continue with the series. 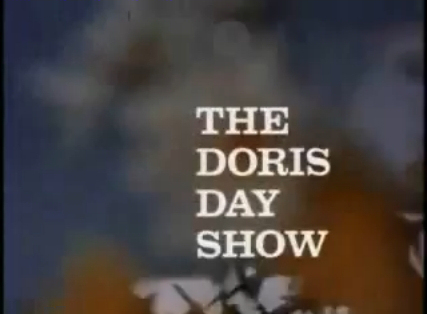 With its changes in format over its run, The Doris Day Show reflected the changes American television was experiencing in the late Sixties and early Seventies. The show began as a rural comedy of the sort popular in the Sixties. With its third season it became an urban based domestic comedy of the type in vogue at the time (The Brady Bunch being one example). By the fourth season The Doris Day Show was centred on a single career woman, not unlike The Mary Tyler Moore Show. Watching the entire run of The Doris Day Show would then be something like seeing the changes in American television from 1968 to 1973 in miniature. The third rural comedy to debut in the 1968-1969 season was also one of the last shows to emerge from the cycle towards fantasy sitcoms in the Sixties. The Ghost & Mrs. Muir was loosely based on the 1945 novel and the 1947 feature film based on the novel and starring Gene Tierney and Rex Harrison. The Ghost & Mrs. Muir was developed for television by Jean Holloway, creator of the now forgotten series Mayor of the Town and a writer who had worked on shows ranging from Wagon Train to Dr. Kildare. The show differed a good deal from both the novel and the film, not the least of which was updating the setting from early 1900's England to 1960's Maine. For whatever reason the main character, young widow Lucy Muir (played in the film by Gene Tierney), was renamed "Carolyn (played by Hope Lange)" in the TV series. Rather than only having a daughter, as in the book and the film, in the TV show Carolyn Muir had a son as well. One thing that did not differ from the book or the film was the presence of a ghost, that of Captain Daniel Gregg (played in the film by Rex Harrison and in the TV series by Edward Mulhare). The Ghost & Mrs. Muir centred on young widow Carolyn Muir, who moved into Gull Cottage near the small village of Schooner Bay. She had two children, her daughter Candy (played by Kellie Flanagan) and son Jonathan (played by Harlen Carraher). Gull Cottage also had one other resident, namely the ghost of Captain Daniel Gregg, a 19th Century sea captain. Captain Gregg had the usual array of ghostly powers. He could move objects. He could appear and disappear at will. He could even affect the weather (a few storms did arise due to his anger). Charles Nelson Reilley played Claymore Gregg, one of the captain's descendants and Schooner Bay's town clerk (among various other jobs). Captain Gregg did not think terribly much of Claymore and Claymore, one of the few who was aware of the captain's ghost, was terrified of him. Rounding out the cast was Reta Shaw, as Carolyn Muir's housekeeper Martha Grant. Although the format of The Ghost & Mrs. Muir branded it a fantasy sitcom and its setting clearly made it a rural sitcom, the show had a bit of a split personality. Most of the plots were those typical of a fantasy sitcom, such as one in which Captain Gregg must face off against a ghost hunter. Yet others episodes were more typical of the domestic comedies of the time, such as one in which Jonathan is having problems playing little league baseball. As might be expected of a rural comedy set in a small town, the village of Schooner Bay does play a major role in some episodes. In one episode the village decided to erect a statue to a local hero and Captain Gregg is incensed that it is not him. In another Schooner Bay celebrated its centennial. The Ghost & Mrs. Muir debuted on NBC on 28 September 1968. Unfortunately it aired against My Three Sons on CBS (ranked #14 in the Nielsens) and The Lawrence Welk Show on ABC (ranked #28 for the year). NBC then cancelled The Ghost & Mrs. Muir due to low ratings towards the end of the 1968-1969 season. Fortunately the show was picked up for the 1969-1970 season by ABC. Unfortunately, it was once more scheduled against a high rated domestic sitcom on CBS, Family Affair (then #5 in the Nielsens for the year), as well as the popular Daniel Boone on NBC. ABC then cancelled The Ghost & Mrs. Muir. Its last episode aired 13 March 1970. The 1969-1970 season should perhaps be considered the end of the cycle towards rural comedies. Green Acres had dropped out of the top twenty shows for the year in the 1968-1969 season. The 1969-1970 season saw The Beverly Hillbillies slip from #10 to #18, a decline which would continue into the following season. Although it was still a hit, Gomer Pyle U.S.M.C. had gone off the air when Jim Nabors decided to move onto other things. He received his own variety show that season. The 1969-1970 season was the final season of Petticoat Junction, which CBS had only renewed so it would have five years worth of colour episodes for syndicated reruns. Although Mayberry R.F.D. and The Doris Day Show were both doing very well, it also seems that the cycle was finally coming to an end. Indeed, only one rural comedy would debut in the 1969-1970 season and it would prove to be a failure. Mr. Deeds Goes to Town was based on the 1936 Frank Capra film of the same name, and updated to the Sixties. It starred Monte Markham as Longfellow Deeds, newspaper publisher who from the small town of Mandrake Falls. Mr. Deeds inherited a huge corporation from his late and somewhat corrupt uncle Alonzo P. Deeds. The show then centred on the conflict between Mr. Deeds' honesty and small town guilelessness and the sometimes unscrupulous culture of big business. Mr. 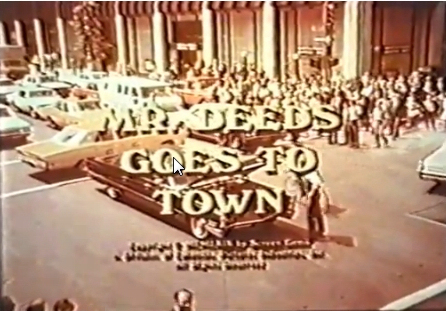 Deeds Goes to Town debuted on ABC on 26 September 1969. It had the misfortune to be scheduled against the still popular Hogan's Heroes on CBS and The Name of the Game on NBC. As result it suffered consistently low ratings and its last episode aired on 16 January 1970. It would be the last rural comedy to debut in the Sixties. Headmaster proved very unpopular with both critics and audiences alike. It should be no surprise, then, that it was soundly beaten in the ratings by The Partridge Family (which ranked #25 for the year). Headmaster was promptly cancelled and replaced with a show that featured Andy Griffith in more familiar surroundings. The New Andy Griffith Show was a rural comedy, the last to debut before the Rural Purge (which was in the works even as it premiered). It starred Andy Griffith as Andy Sawyer, who returns to his hometown of Greenwood, North Carolina only to find himself elected Mayor Pro Tem. Lee Merriweather played his wife Lee, while Marty McCall and Lori Rutherford played his children, T.J. and Lori. Ann Morgan Guilbert played his sister in law, who lived with them and was always interfering. The New Andy Griffith Show debuted on 8 January 1971. Although it was much closer in spirit to the phenomenally successful Andy Griffith Show, it also suffered from perpetually low ratings. Its last original episode aired on 12 March 1971 with reruns continuing until 21 May 1971. For the summer CBS aired reruns of Headmaster in its slot. Even if The New Andy Griffith Show had done better in the ratings, one has to question whether it would survive. Quite simply, the 1970-1971 season was the year that CBS committed the Rural Purge, a mass cancellation of shows that appealed to audiences that were largely rural, older, or both. Although it might have seemed as if it was a spur of the moment decision on the part of CBS at the time, the Rural Purge had actually been coming for some time. 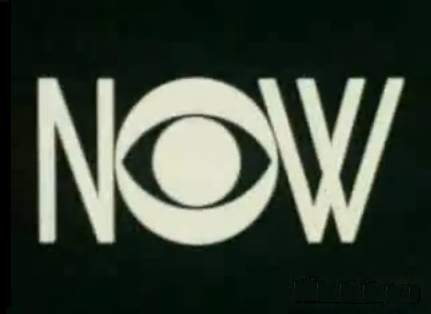 As early as March 1967, in an article in Variety, a CBS executive expressed concern over the network's ageing audience. At that time it was reported that CBS was planning to redo its schedule to better compete with NBC for younger viewers. Indeed, it was in 1967 that long running game shows I've Got a Secret, To Tell the Truth, and What's My Line?, as well as the long running oater Gunsmoke, were cancelled by CBS because their audiences skewed too old. Gunsmoke would be swiftly returned to the schedule, but the game shows would not. Regardless, the rural comedies' days would be numbered once Robert D. Wood became president of CBS in 1969. Mr. Wood was concerned both by CBS' slipping ratings for the past few years (although it was still the #1 network), and also worried that CBS was not attracting the young, urban audiences desired by advertisers. According to the book Blockbuster TV: Must-See Sitcoms in the Network Era by Janet Staiger, plans for what would become known as "the Rural Purge" were probably being made as early as October 1969. It was at the CBS affiliates' meeting in May 1969 that Robert D. Wood announced "...a young, fresh, new approach to programming." It was in June 1970 that he appointed Fred Silverman as Vice President, Programmes, essentially the head of the programming department. It would be Fred Silverman who would serve as the architect of the Rural Purge. Here it should be pointed out that while the Rural Purge appears to have been in the planning stages as early as October 1969, there are some series cancellations prior to the 1970-1971 season that should not properly be considered preludes to the Rural Purge, even though they often are considered such. Gomer Pyle U.S.M.C. was not cancelled by the network at all, but rather it ended its run because its star wished to move onto other things. Indeed, CBS immediately gave Jim Nabors his own variety show, which appealed to the same rural audience as Gomer Pyle U.S.M.C. The Jim Nabors Hour would be cancelled as part of the Rural Purge in the 1970-1971 season. Petticoat Junction is another show whose cancellation probably should not be considered a predecessor to the Rural Purge. The show's ratings had been declining since the death of Bea Benaderet and, in fact, CBS considered cancelling it at the end of the 1968-1969 season. It received a single season reprieve because the network wanted five full years worth of colour episodes for syndication. The cancellation of The Jackie Gleason Show during the 1969-1970 season is also often considered a precursor to the Rural Purge, although it should not be either. In fact, it is difficult to say whether CBS cancelled The Jackie Gleason Show or Jackie Gleason cancelled CBS. Quite simply, CBS wanted him to do more segments with "The Honeymooners", drop the all-variety segments of the show entirely, and deliver 24 to 26 shows per season. 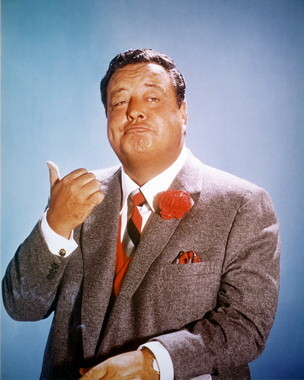 Jackie Gleason did not want to stop doing the all variety segments and did not want to do more than 20 shows per season. Since Mr. Gleason and the network could not come to an agreement, the show came to an end. Of course, CBS did cancel The Red Skelton Show in the 1969-1970 season, and it seems likely that part of the reason for its cancellation was the fact that his audience was older and more rural. That having been said, a large part of the reason for the cancellation of The Red Skelton Show may have been the salary of its star. Mr. Skelton's contract stipulated that he was to receive a raise in salary every year. It seems quite likely, then, that CBS cancelled his show as much out of concern over his salary as the demographics of his audience. Regardless, NBC picked up The Red Skelton Show for the 1970-1971, although it was shortened from an hour to a half hour. It would not last beyond the 1970-1971 season. Regardless of whether The Jackie Gleason Show and The Red Skelton Show can be considered preludes to the Rural Purge, the Purge may well be the largest mass cancellation of shows of a specific type in American television history. None of CBS' rural comedies survived. The Beverly Hillbillies, Green Acres, and Mayberry R.F.D. were all gone. 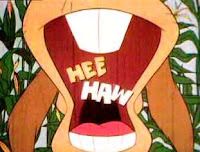 Shows in other genres that appealed largely to rural populations were also cancelled, including the variety shows Hee-Haw and The Jim Nabors Hour. Not all shows cancelled in the Rural Purge were due to their audiences being too rural. Some were cancelled because their audiences were simply considered too old. This was the case with Family Affair, Hogan's Heroes, To Rome with Love, and The Ed Sullivan Show. CBS also cancelled the long running Lassie (I am not sure why, but I can imagine its audience may have been too young--in prime time ratings, children don't count). As Pat Buttram (who played Mr. Haney on Green Acres) commented on the Rural Purge, "It was the year CBS killed everything with a tree in it, even Lassie." While the Rural Purge mostly took place at CBS, NBC and ABC also cancelled a few shows in the 1970-1971 season because of demographics. NBC cancelled The Men From Shiloh (the title of The Virginian in its final season), The Andy Williams Show, The Red Skelton Show, and Wild Kingdom because their audiences were too old, too rural, or both. ABC cancelled The Johnny Cash Show because its audience was too rural and The Lawrence Welk Show because its audience was too old. Here it must be pointed out that overall ratings were less of a concern to the networks than the demographics to which the shows appealed. 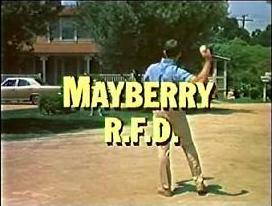 At the time of their cancellations, Mayberry R.F.D. was ranked #15 for the year and Hee Haw was ranked #16 for the year. On NBC The Men From Shiloh was ranked #18 for the year. Other shows, such as The Ed Sullivan Show and The Lawrence Welk Show were doing well enough in the ratings to warrant renewal. Even shows that had been declining in the ratings for the last few years, such as The Beverly Hillbillies and Green Acres, still won their time slots and did well enough that in any previous year they could have been renewed. Curiously, both Hee Haw and The Lawrence Welk Show entered first run syndication, where they remained for years. The mass cancellations of rural shows and shows that appealed to older people was fairly big news in the 1970-1971 season. In fact, it was even as it was taking place that the phrase "rural purge" was first used. As early as 10 February 1971, in an article by Clarence Petersen in The Chicago Tribune titled "Ax May Fall on Sullivan and Rurals", the phrase "rural purge (not yet capitalised)" appeared. As pointed out above, the Rural Purge was actually in the planning stages well before it took place. It should then come as no surprise that, contrary to popular belief, the networks did not suddenly take notice of demographics in the late Sixties. Oliver Treyz, the president of ABC from 1956 to 1962, often used demographics to show that the then third rated network appealed most to the 18-34 demographic most desired by advertisers. Perpetually second rated NBC also utilised demographics from time to time, airing shows meant to appeal to young throughout the Sixties. While for most of the Sixties CBS concentrated on overall ratings rather than pursuing any particular demographic, as early as 1967 the network was concerned about its older and somewhat more rural audience, and even cancelled three successful prime time game shows because their audiences were too "old". Basically, CBS and the other networks did not suddenly discover demographics in the late Sixties. Instead it was a simple case of CBS changing its programming strategy in the late Sixties and early Seventies. Of course, demographics were not the only factor that led to the Rural Purge. Another factor was the Prime Time Access Rule. The Prime Time Access Rule grew out of the Federal Communications Commission's concern over the dominance of the broadcast networks in television production and programming. The Prime Time Access Rule was then enacted in the hope of increasing diversity on local stations, allowing them to air different sorts of shows in time slots that once belonged the networks. To this end, the Prime Time Access Rule restricted network programming from 8:00 PM Easterm/7:00 PM Central to 11:00 PM Eastern/10:00 PM Central. This meant that the networks lost several hours' worth of time slots each week going into the 1971-1972 season. It also meant that they had to cancel many more shows than they ever had to before. Since CBS had to cancel many more shows than they usually would, they then took the opportunity to rid themselves of shows that appealed to older and rural audiences. Another factor that may have led to the Rural Purge, although it is one that is not easily quantified or even verified, might have been sheer cultural bias. In the Fifties Irving Pincus had difficulty selling The Real McCoys because network executives thought viewers would have no interest in watching a show about rural people. Of the Rural Purge, Fred Silverman himself said, "The time has come to go big city as opposed to hayseed." For better or worse, rural humour has always been somewhat looked down upon. It has been considered lowbrow and unsophisticated. On the part of executives belonging to what some jokingly called the "Country Broadcasting System', there may have been a desire to distance themselves from shows they considered lowbrow and uncultured. Indeed, with an ongoing cycle towards relevant shows, shows that dealt with the issues of the day, at the time, network executives and others may have looked down upon the rural comedies more than they ever had. Indeed, most of the rural comedies fastidiously avoided current issues. Despite being set on a Marine base Gomer Pyle U.S.M.C. never referenced the ongoing Vietnam War. Not only was the Civil Rights movement never mentioned on The Andy Griffith Show, but Mayberry appeared to be the only Southern town with no black population whatsoever (here I should point out that according to Howard Morris in a retrospective on the show there were those who worked on The Andy Griffith Show who wanted African American characters on the series). Only The Beverly Hillbillies occasionally addressed current issues, and, even then, it was choosy about what to cover (the Student Movement, but not the anti-war movement, and so on). As a whole minorities were missing from the rural comedies of the Sixties, notable exceptions being The Real McCoys and Kentucky Jones. Of course, here it must be pointed out that the rural comedies were not alone in ignoring the issues of the day or not featuring minority characters. The Sixties was an era of escapist television, so that one would not see the Vietnam War mentioned on Please Don't Eat the Daisies any more than he or she would The Andy Griffith Show. And, sadly, minority characters were rarely seen on any situation comedies, rural or otherwise, for most of the decade. One factor that did not play a role in the Rural Purge, although it is often cited, was the debut of All in the Family. All in the Family debuted on 12 January 1971 even as the Rural Purge was about to take place. Its ratings were so poor that, even given the large number of shows CBS had cancelled in the Rural Purge. there was no guarantee that it would be renewed. What ultimately saved All in the Family were the seven Emmy nominations it received (three of which it won) on 14 April 1971 when the National Academy Television Arts and Sciences announced their Emmy nominations. It was on 21 April 1971 that CBS finally renewed All in the Family. Of course, All in the Family would improve in the ratings, becoming the #1 show for the 1972-1973 season and staying there for five years. Regardless, debuting even as the Rural Purge was about to take place, doing poorly in the ratings even as it was taking place, and being renewed after the Rural Purge had taken place, All in the Family did not play an important role in the Rural Purge. That having been said, its success in the coming season did point the way for CBS to go with regards to programming after having cancelled nearly all of their rural shows. The cycle towards rural comedies in the Sixties ended with the 1969-1970 season. The Rural Purge decimated the rural comedies that were remaining. In the decades since the Rural Purge there has been very little in the way of rural programming of any kind, let alone comedies. Only about a year and a half after the Rural Purge had taken place, CBS debuted a rural drama, The Waltons, that proved to be one of the surprise hits of the Seventies. Later in the decade they would debut a rural action comedy entitled The Dukes of Hazzard. Since then there have only been a few scattered rural comedies throughout the years. Newhart (set in rural Vermont), Evening Shade (set in rural Arkansas), Roseanne (set in the small Illinois town of Lanford), and Parks and Recreation (set in the small town of Pawnee, Indiana) are some of the very few rural comedies that have aired since the Rural Purge. Perhaps significantly, many of these shows saw a good deal of success and some even attracted the young, urban viewers the networks want so badly. While the rural comedies were sometimes ridiculed for being corny and, as the Sixties became the Seventies, mocked for not being "relevant", there can be little doubt that they spoke to a large number of Americans in a way that later urban sitcoms did not. For all that All in the Family addressed such important issues as the Vietnam War, abortion, feminism, and so on, people in small towns and rural areas might well have found it easier to relate to the characters on The Andy Griffith Show or, even given the exaggeration, Green Acres. I rather doubt many people in small towns (or even big cities, for that matter) stand around and argue about various issues the way Archie and Mike did on All in the Family, but some of the problems and disagreements seen on The Andy Griffith Show do actually occur in small towns from time to time (at least ones in this county). For all their flaws, in some respects the rural comedies may have been more relevant for many than the so called "relevant" comedies that came after them. Indeed, it must be pointed out that many of the shows to emerge from the cycle towards rural comedies in the Sixties, even some cancelled in the Rural Purge, have persisted in syndication ever since. The Andy Griffith Show, The Beverly Hillbillies, Petticoat Junction, Gomer Pyle U.S.M.C., and Green Acres can still be seen in reruns on local stations throughout the United States to this day. In fact, The Andy Griffith Show may well be more popular than many, much more recent shows. While CBS may have thought the rural comdies attracted the wrong demographic, the fact is that they have maintained their popularity for decades after many of the shows that replaced them have faded away. By the 1965-1966 season the cycle towards rural comedies was five years old. It had been the success of The Real McCoys in 1957 that had opened the doors for rural comedies and it had been the success of The Andy Griffith Show in 1960 that insured that there would be several more to follow. The 1965-1966 season would be no different, with the debut of two more rural comedies during the season. The first of the two rural comedies would be one of the hits of the season, and remains one of the most famous rural comedies of all time. This should come as no surprise, as Green Acres was produced by Paul Henning, the creator and producer of both The Beverly Hillbilies and Petticoat Junction. While Green Acres shared the Hooterville setting of Petticoat Junction, however, Paul Henning was not the creator of Green Acres. Instead that honour goes to Jay Sommers. Like Paul Henning, Jay Sommers' career had begun on radio. He worked on radio's most famous hillbiily sitcom Lum and Abner, as well as writing for Milton Berle, Eddie Cantor,and Red Skelton. Like Paul Henning, Jay Sommers also made the move to television. Prior to Green Acres Mr. Sommers worked on such TV shows as The Adventures of Ozzie and Harriet and Dennis the Menace, as well as Petticoat Junction. In fact, Green Acres actually has its roots in a radio show created, written and produced by Jay Sommers, titled Granby's Green Acres. Granby's Green Acres was a spin off of the popular Lucille Ball radio show My Favourite Husband after a fashion. On My Favourite Husband Gale Gordon and Bea Benaderet (who eventually found her way to Petticoat Junction) played banker Rudolph Atterbury and his wife Iris Atterbury. Granby's Green Acres essentially took the Atterburys, gave them new names, and placed them in a new setting. Quite simply, on Granby's Green Acres Gale Gordon and Bea Benaderet played banker John Granby and Martha Granby, who move to the country to take up farming. Eb (played by Parley Baer) was the Granby's old farmhand. Granby's Green Acres had a very brief run, only lasting from 3 July 1950 to 21 August 1950. 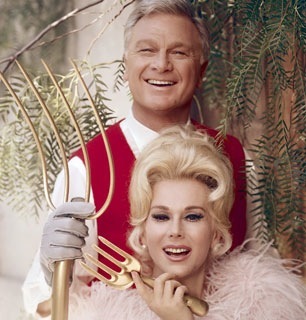 Green Acres centred on New York City lawyer Oliver Wendell Douglas (played by Eddie Albert) who decided to fulfil his dream of becoming a farmer, much to the displeasure of his glamorous wife Lisa (played by Eva Gabor). Unfortunately, Mr. Douglas bought a run down farm with its derelict house from Hooterville's local con man Mr. Haney (played by Pat Buttram). The sometimes temperamental Mr. Douglas knew nothing about farming, and his efforts more often than not met with failure. He received little help from his young, glib, but none too bright farmhand Eb Lawson (played by Tom Lester), who regarded himself as the Douglases' adopted son (something with which Mr. Douglas disagreed). He also received little in the way of help from Hooterville's county agent, the scatterbrained Hank Kimball (Alvy Moore). Set in Hooterville, Frank Cady naturally appeared in the regular role of Sam Drucker, owner and operator of the general store. Other characters included the Douglases' neighbours, Fred (played by Hank Patterson) and Doris Ziffel (played by Barbara Pepper in the show's first three seasons and by Fran Ryan in its last two), who treated their pig Arnold as their son (as did everyone else in Hooterville, except Mr. Douglas). Although set in Hooterville, Green Acres was much closer in spirit to The Beverly Hillbillies than Petticoat Junction. Like The Beverly Hillbillies, Green Acres was in many respects an absurdist farce. That having been said, it differed from The Beverly Hillbillies in that it was not so much a comedy about culture conflict as it was a comedy about perceptions of reality. Quite simply, there is the reality that Mr. Douglas perceives and the reality that everyone else in Hooterville perceives (even his wife Lisa). For instance, while Mr. Douglas had difficulty accepting Arnold Ziffel as anything other than a very intelligent pig, the other Hootervilians (including his wife Lisa) insist on treating him like a human child, even to the point that he attends school. It must also be pointed out that Mr. Douglas seems to be the only character on Green Acres who is unaware that he is on a television show. An example of this are those instances where Lisa can hear the theme music and see the credits, while Mr. Douglas is totally unaware of them. Quite simply, not only was Mr. Douglas a "real person in an unreal situation", he was a real person surrounded by unreal people in what can only be described as an unreality. Like Petticoat Junction, Green Acres was bought without a pilot. And like Petticoat Junction it proved to be a hit. In its first season it ranked #11 in the Nielsen ratings out of all the shows on the air for the year. In its second season its ratings actually improved, as it rose to #6 for the year. Green Acres remained in the top twenty shows for the year for its next two seasons. Green Acres was still receiving respectable ratings in its last season (coming in at #34 for the year) when it was cancelled as part of the Rural Purge during the 1970-1971 season. The second rural sitcom to debut during the 1965-1966 season was Tammy, based on the 1957 Universal Pictures film Tammy and the Bachelor and its two sequels. Debbie Reynolds had originated the role of Tammy Tyree in Tammy and the Bachelor, with Sandra Dee taking over the role for the two sequels, Tammy Tell Me True (1961) and Tammy and the Doctor (1963). For the television series the role of Tammy went to another Debbie, namely sixteen year old Debbie Watson. Miss Watson had starred in the single season sitcom Karen in the 1964-1965 season and would take Pat Priest's place as Marilyn Munster in the film Munster Go Home (1966), even though Marilyn on The Munsters had been a little bit older. Tammy was loyal to the film series to a degree. Tammy Tarleton (for some reason her surname was changed from Tyree for the TV show) lived on a houseboat in the bayou with her grandfather Mordechai (played by Denver Pyle) and her Uncle Lucius (Frank McGrath). 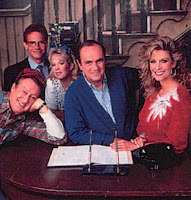 Tammy worked as a secretary for the rich Brent family, which included patriarch John Brent (Donald Woods) and his son Steven Brent (Jay Sheffield), who provided a love interest for Tammy. Much of the series was based around the conflict between Tammy's bayou roots and the Southern high society in which she sometimes operated as the Brents' secretary. Tammy debuted 17 September 1965 on ABC. It had the misfortune to be scheduled against The Wild Wild West. Then in its first season, The Wild Wild West would prove to be one of the hits of the season, coming in at 23 in the Nielsen ratings for the season. As to Tammy it lasted only one season and 26 episodes. The 1966-1967 season would see no new rural comedies debut for the first time since the 1960-1961 season. Despite this, the 1966-1967 season should best be considered a lull in the cycle towards rural comedies rather than the end of the cycle. Indeed, five more rural comedies would debut before the end of the Sixties. That having been said, some of the rural comedies of the later Sixties would see the genre combined with other sitcoms genres. The mid-Sixties saw a cycle towards what can only be described as "gimmick comedies", the concepts of which could not easily be described in one sentence. The cycle began in the 1965-1966 season with the sitcom Hank and continued in the 1966-1967 season with Occasional Wife. The 1967-1968 season saw the debut of more gimmick comedies, among which was one that can also be considered a rural comedy: Accidental Family. Accidental Family starred Jerry Van Dyke as widowed comedian Jerry Webster, who could have custody of his 8 year old son Sandy (played by Teddy Quinn) only if he raised him in an environment other than Las Vegas. Fortunately, Jerry owned a farm in the San Fernando Valley. There was only one problem. He could not evict the farm's one tenant, divorceé Sue Kramer (Lois Nettleton), who has a daughter of her own (Tracy, played by Susan Benjamin). Jerry and Sue struck a deal, whereby Sue would live on the farm and take care of Sandy while Jerry was performing in Las Vegas. The farm's only hand was Ben McGrath (Ben Blue), a former vaudevillian. Larry Mann (played by Marty Warren) was Jerry's agent. Accidental Family was created by screenwriter Melville Shavelson, who had written the screenplays for such films as Wonder Man (1946), The Seven Little Foys (1955), Houseboat (1958), and The Five Pennies (1959) among many others. 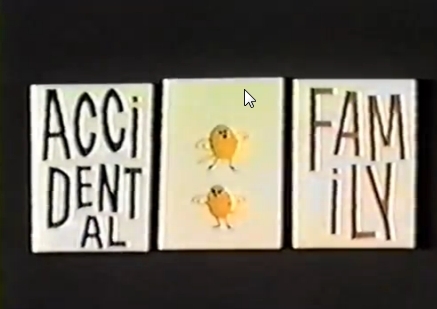 The original title of the show was Everywhere a Chick Chick, but it was changed to Accidental Family in July 1965, two months before its debut. In the 25 March 1965 issue of The Los Angeles Times entertainment columnist Hal Humphrey described the show as comedy cross between Green Acres and Family Affair. Although largely forgotten now, Accidental Family was a historic show. It was the first American sitcom to feature a divorced woman as one of the central characters. As a result it was also one of the first American situation comedies to deal with the issue of divorce. Indeed, in the aforementioned Los Angeles Times article Hal Humpreys reported that Proctor & Gamble had rejected sponsorship of the show "...because it looked immoral to them" (presumably referring to the fact that widower Jerry and divorcee Sue were living under the same roof without being married). Here it should be pointed out that, according to a 7 August 1967 Associated Press article by Cynthia Lowry, Jerry was going to be divorced as well, but he was changed to a widower because "...sponsors wouldn't touch the show..."
Accidental Family debuted on 15 September 1967. Unfortunately it was scheduled against The CBS Friday Night Movies (which would rank #15 for the season) on CBS and the popular Western The Guns of Will Sonnett on ABC. The fact that it was scheduled following a very low rated sci-fi show titled Star Trek probably did not help matters. Regardless Accidental Family received bottom of the barrel ratings and only lasted half a season. It went off the air on 5 January 1968. While no rural comedies had debuted in the 1966-1967 season and only Accidental Family had debuted in the 1967-1968 season, the cycle towards rural comedies was hardly over. In fact, the 1968-1969 season would see there rural comedies debut, the most since the 1964-1965 season. Unfortunately, even as those shows there would be forces conspiring that would insure the Sixties would be the last decade to see a plethora of rural shows of any kind, including comedies.